If the Packers are anything, they’re creatures of habit. From their weekly game prep routines to their tendency to get a single injury en masse during the course of a season, the Packers are never real surprising. And that goes as well for some Packer fans as well. They are more often than not the most respectful and knowledgeable fans I have encountered on a regular basis, but sometimes they fall victim to making hot takes. These past couple of weeks have led to one major hot take that is as premature as it has been for years: a second year player is struggling in camp and in preseason, so now he’s a bust and should be cut. In 2015 it was Davante Adams. Last year it was Quentin Rollins late in the season. This year it has been offensive tackle Jason Spriggs. Spriggs is a rare breed in Packer lore, a prospect who Ted Thompson actually traded up early in the draft to get. Seen by many as a first-round prospect in the 2016 Draft, he fell into Round 2 because he needed time to develop more than the other tackle prospects. Raw and athletic, the Indiana product dominated the Combine, leading many people to believe that he could be a cornerstone left tackle in time. But there is a key two words there: in time. Spriggs showed his athleticism during last year and easily proved that he likely the best athlete in the trenches. But he struggled in limited action both at tackle and as the emergency right guard after TJ Lang got hurt in the middle of last season. It showed more than anything that while he had the potential, he still needed a lot of work and that James Campen had someone who he could really mold. But that type of video is part of the problem. We tend to look at offensive linemen only when they make a mistake. And while Spriggs has had a really rough couple weeks, he has shown some good tape as well, especially on some combo blocks with his left guard. But much like Davante Adams during his second year, it is way too early to dismiss a talented young player because he is struggling in camp. Spriggs may not pan out, but he also just might become a Pro Bowl-level tackle. He has the talent. Now he just needs the patience from his coaches and the confidence only a great fanbase like Green Bay can give. This entry was posted in Authors, Mike Wendlandt, Packers 2016 - 2017 Season, Seasons and tagged 2017 Season, Jason Spriggs, Packers, ted thompson. Bookmark the permalink. IU grad here and pulling for Spriggs! Agree he has lots to learn still, but way to early to give up on him. As a football coach myself for almost 40 years, laymen don’t know the scheme, don’t know who one should pick up, etc. and to try and evaluate a player when you do not understand his responsibilities is misguided. 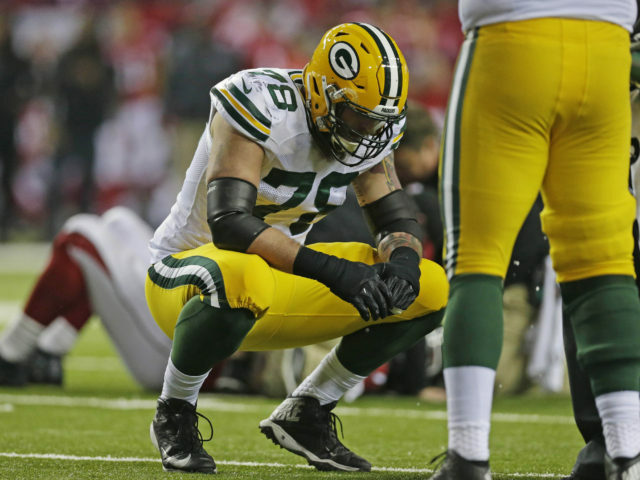 The Packers do a great job of developing and Spriggs may simply need more time. That’s good to here. Our OL coach Campen can I believe bring this man along. He was a lineman for the Packers so who better to work with him.